Having the right shipping pallet for your products is vitally important to ensuring those products move through the supply chain safely. A reliable pallet makes the difference between swiftly moving product off the truck and to its next destination, and picking single inventory items off the floor of the receiving dock because of pallet failure. Most logistics managers will see choosing the right pallet as a matter of block pallets vs. stringer pallets, since these are the most commonly encountered pallet styles. Comparing the two is relatively straightforward at first, but as you learn more about these pallets, the choice may become more difficult. Both types of platforms have their virtues, but ultimately share the same basic flaws. That’s why we’ll also talk about a third alternative to the old standbys of wood block and stringer pallets. The biggest difference between block and stringer pallets is the support used between the top and bottom decks of the pallet. Stringer pallets are held together by three two-by-four boards, one running along each side of the pallet and one through the middle. These are the stringers that give the pallet its name, and they are usually notched to allow forklift access from all four directions. Block pallets are held together by nine four-by-four-inch wood blocks, sometimes with additional boards around the perimeter that reinforce the top and bottom decks. The stringer pallet, with its basic utilitarian design, has lasted into the present as one of the most common pallets, and odds are that this is the design most people think of when they hear the word pallet. That may be because these are the pallets that DIYers and upcyclers often use in projects. They’re not very durable and are designed to make only a couple trips through the supply chain before being discarded. Stringer pallets tend to pile up behind shopping centers, grocery stores, and warehouses because they’re really only robust enough to travel one way through the supply chain. “One and done” stringer pallets require companies to constantly replace old stringer pallets with new ones to keep supply chains running. Block pallets, on the other hand, are designed for greater durability, and for that reason, more wood goes into building them. They also feature many more nails, and those nails are significantly heftier than the ones found on stringer pallets. The result is a sturdy, fully four-way pallet that can make far more trips through the supply chain than the stringer pallet. However, the sturdiness of the block pallet means a significant increase in weight and in the fuel needed to transport them. Although stringer pallets are less durable than block pallets, their low price makes them tempting for many supply chain managers, and in some circumstances, they may be a reasonable choice. If you’re shipping a partial unit load to a part of the supply chain in which bringing the pallets back is impractical, a lightweight and inexpensive stringer pallet may be the best platform to use. Heavy Goods Shipper: Products like bottled water, beverages, and canned goods are heavy. A block pallet is a better choice than a stringer pallet for these goods as the more robust construction of the block pallet handles the weight and movement more easily than a stringer pallet and with less risk of failure. Multi-Step Supply Chain: A block pallet is more likely to hold together through repeated handling than a stringer pallet, and this makes block pallets a better choice for complicated supply chains that see loads of product changing hands multiple times. Reducing Wasted Materials: Block pallets are able to make many more trips through the supply chain than the typical stringer pallet. If a logistics manager is in the position to set up a reverse supply chain to bring them back to the production site once they’ve completed a trip through the supply chain, then using block pallets can reduce the need to constantly replenish a supply of pallets. Reducing Rejected Loads: Retailers are quick to reject loads that come in on pallets they find unacceptable, and the cost of these rejected loads–or the cost to transfer a load to an acceptable pallet–add up quickly. Stringer pallets are much more likely to be rejected than block pallets; in fact, some retailers will not accept stringer pallets at all, requiring their suppliers to use wood block or alternative material pallets. 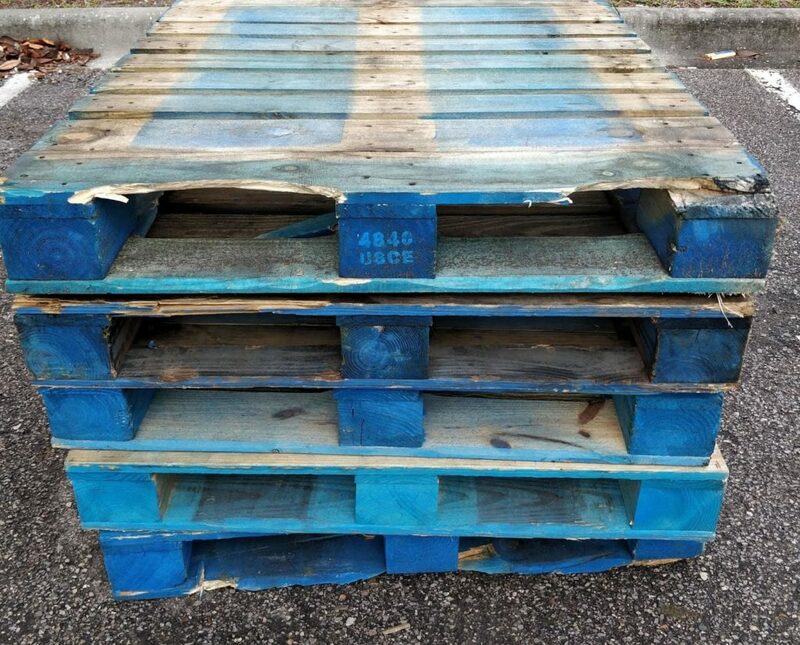 Despite the superiority of block over stringer platforms, both types of pallets suffer from the same issues: loose wood and nail debris, which can damage products, packaging, and machinery, as well as injure workers; damage to the platform itself over time, resulting in cracked boards, splinters, and even total pallet failure; and difficult–or impossible–sanitization of the wood, which absorbs moisture and chemicals and may spread contamination. For these reasons, many supply chains may be better served by a third pallet option: plastic pallets. Plastic pallets combine the advantages of stringer pallets with those of block pallets and add quite a few of their own advantages as well. Plastic pallets have a durability that vastly exceeds even that of wood block pallets, and at less than fifty pounds, their weight is comparable to that of stringer pallets. Due to their resilience, high-quality plastic pallets can make 80-100 trips through the supply chain, many times the number of trips that block pallets are able to make. The light weight and reusability of plastic pallets enables them to reduce the strain on employees and equipment, lower transportation fuel costs, and eliminate the need for a constant supply of new pallets. Supply chains can enjoy these advantages with very little additional effort through the use of a plastic pallet pooling system which manages the transportation and supply of pallets to make them available when and where they’re needed. Choosing a pallet isn’t about block pallets vs. stringer pallets anymore; pooled plastic pallets offer an alternative that’s superior to any wood pallet. The iGPS plastic pallet pool offers high-quality shipping platforms that are stronger and more consistent than wood block or stringer pallets. To get started with a cost-saving wood pallet alternative, give our team a call at 1-800-884-0225, email a specialist at switch@igps.net, or visit our contact page.